The Pro X Tee Hitting System, includes Pro X Tee 300 tee bar with five tee top placemant options and comes with 3 tee tops. 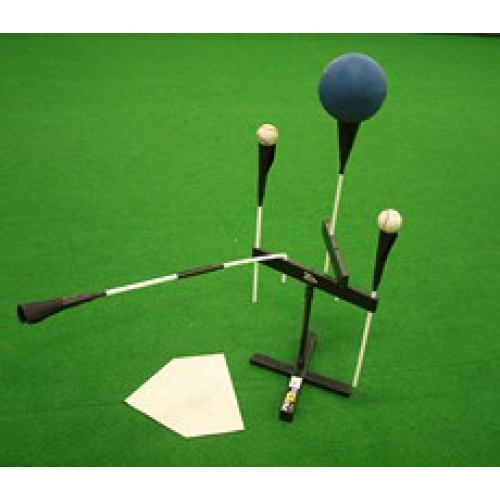 The Pro X Tee Hitting system and What?? A ball bag attachment that holds a full bucket for BP or Tee Training? The "NEW" Built in quick clamp extension system allows for High Tee drills for hitters as tall as 6' 5". Remove the extension post and put the ball at 18 inches for Low Ball Drills. Load Drills Power Drills and many more! No other Tee can match it. The "2009 ABCA and COLLEGIATE BASEBALL MAGAZINE NEW PRODUCT OF THE YEAR"
The Pro X Tee Hitting system is flat out a muscle memory training system for hitters. The ProXTee 300 uses 3 tee tops for full plate coverage and virtually unlimited training options. Over 300 Colleges and Major League Teams choose ProXTee to train their hitters. This is a complete hitting training station and packs into a travel bag.